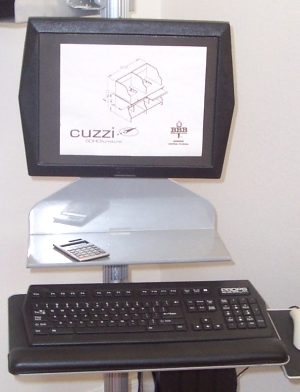 This is the original shelf that comes included in the CUZZI VC01 Pole Computer Workstation. 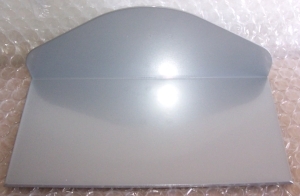 It is used for placing small devices or stationery. It is made of 3 mm thick steel, covered with powder coated silver paint. This item includes the height adjustable mount bracket to attach it to the VC-01 computer pole. 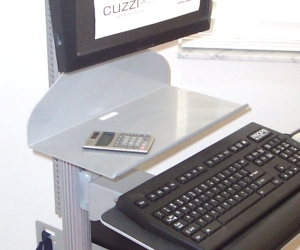 As all items attachable to the VC-01 Pole Computer Cart, this shelf can be mounted anywhere on the pole. A deeper shelf, the 12" deep MT, is also available, and is generally used as a printer or laptop shelf (see set of links below).